Crude birth rate: The number of births per thousand individuals in a population per year. Crude death rate: The number of deaths per thousand individuals in a population per year. Natural increase: (Crude birth rate – Crude death rate)/ 10. Fertility rate: The number of births per thousand women of child-bearing age. Total fertility: The average number of children a woman has in her lifetime. Doubling time: The number of years it would take a population to double its size at its current growth rate. A natural increase rate of 1% will enable a human population to double in 70 years. A high proportion of young dependents puts pressure on the working population as parents need to stay home to care for young children. It also requires significant investment in education by the government. 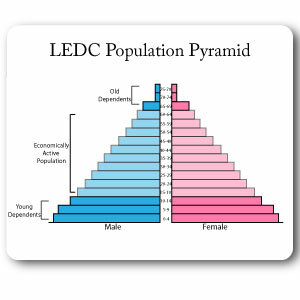 More developed countries typically have aging populations and a declining birth rate. Long life expectancy due to varied diets, and good healthcare have led to increased pressure on the working populations to support them. Some of these countries are starting to see rising death rates as a large section of the population are elderly. These countries face increasing costs and time commitments of caring for the elderly. Increasing taxes, longer working lives and reduced pension funds are resulting. 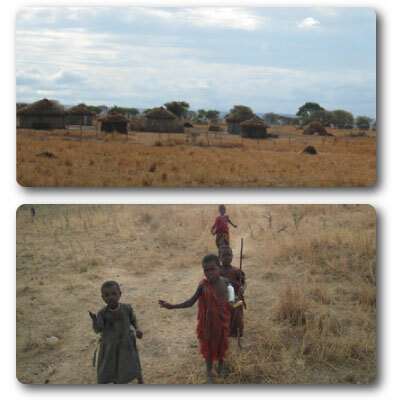 Initial high birth and death rates due to poor diet, disease and harsh living conditions. Advances in healthcare and diet lead to a fall in the death rate, but the birth rate remains high for a period unitl people trust that their children have a high chance of survival. 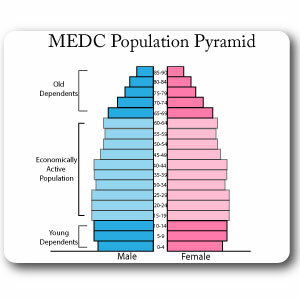 Natural increase and rising population levels occur until the birth rate drops to a similar level to the death rate. Developed countries tend to have low birth & death rates. The DTM was based on the patterns that have been experienced in developed countries. many people argue that they will not necessarily hold true for countries that are currently going through a process of development. Religious and cultural factors may play a large role in whether people will actually choose to have smaller families or not. This century has seen the emergence of a further trend that is not shown on the original DTM. Some developed countries are starting to see increasing death rates as elderly populations start to die and subsequently falling total populations (from natural increase). This fall in natural population can be countered through increases in the level of immigration. A term sometimes used by economists for natural resources that, if appropriately managed, can produce a “natural income” of goods and services. The natural capital of a forest might provide a continuing natural income of timber, game, water and recreation. Tropical rainforests stabalise the climate and protect against flooding and soil erosion in their ecosystem. They can provide us with valuable wood, medicinal compounds and tourism opportunities. 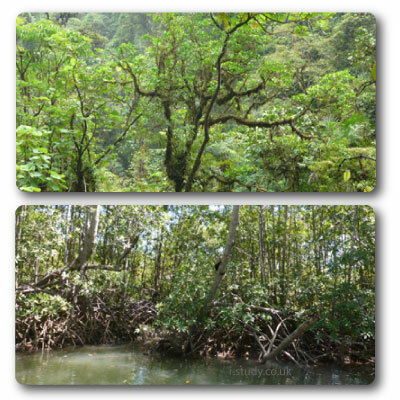 Mangroves provide the habitat for many species but also protect coastlines against storm surges and flooding. They also provide a valuable role in stabalising the climate. Natural resources that cannot be replenished within a timescale of the same order as that at which they are taken from the environment and used. These are the finite resources on the planet such as metals, minerals and fossil fuels. Our consumption of oil, coal and natural gas are depleting the reserves of them, leading to scarcity. Rare earth metals are being mined at increasing rates for the manufacturing of electronic items and will not be replenished. Scientists are already looking at the possibility of rare earth metal mining on the moon. Natural resources that have a sustainable yield or harvest equal to or less than their natural productivity; for example, food crops, timber. Forests can be managed and replanted to ensure continuity. Organisations such as the Forestry Commission in the UK do this. Poor management of renewable natural capital is likely to lead to it depleting. Wood is collected and used for cooking, heating and building in many African countries and this often outstrips its ability to regrow. Most renewable natural capital is based around the agriculture since photosythesis captures the suns energy and converts it into forms we can exploit. Resources are things that are of use to populations. Over time the value we place on resources changes. This occurs for several different reasons such as new technologies, scarcity and environmental concerns. 1) Harnessing or generating power has been a vital aspect of the development of humans. Initially the wind and water were important for early mechanisation. Coal then became a very valued resource as it it could be burnt to power machinery (steam trains) and generate electricity. In recent decades it has become less valued due to the high levels of air pollution produced through burning it. Oil and natural gas are currently highly valued due to ease of transportation, cleaner burning and due to technological advances we can increasingly extract more of it. The invention of nuclear power led to high values being placed on uranium, which previously had very low demand. 2) Scarcity of a resource will increase the value we place on it unless there is an excellent substitute. Dwindling discoveries of new oil reserves has helped pushed up the price for several decades. Diamonds and gold are scarce and subsequently highly valued. 3) Increasing populations on regional and global levels are changing the way we use resources and how we value them. More people means more demand. For resources that are vital such as food and fresh water this is leading to conflicting demands and even conflict. We value fresh water highly but have a limitied supply which is leading to serious investment in sustainable use and recycling. Organisms or ecosystems that are valued on aesthetic or intrinsic grounds may not provide commodities identifiable as either goods or services, and so remain unpriced or undervalued from an economic viewpoint. The bay pictured has very little economic value since no development or business is permitted there. It does however have significant value for the environment (saltmarsh, sand dunes, fish habitat) and a significant visual value for tourists. 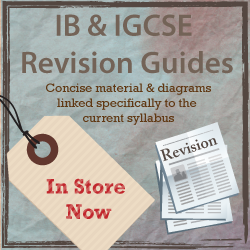 It is hard to place a monetary value of a resource such as this. 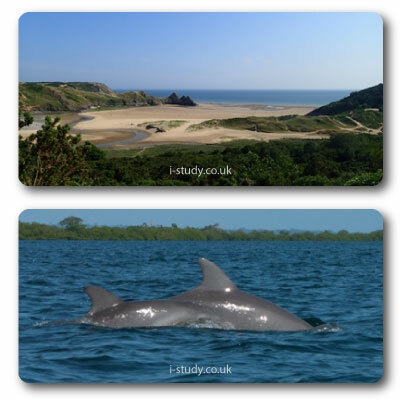 Wildlife such as dolphins also have little economic value (although in some places tourism is linked to them) but also have a high environmental value. Accidents such as the the BP oil spill in the Gulf of Mexico have highlighted issues such as how much compensation should be paid for the death of a dolphin? When attempting to place a value on a natual resource such as an aea of rainforest there are several different types of value that could be considered. Consumptive use: the value of the resources in the rainforest that can be sold for consuming such as the timber and animals that have been hunted. Non-consumptive use: the value that can be gained through using the rainforest for tourism or research. Indirect use: the value of the rainforest in terms of driving the climate, absorbing crabon dioxide, releasing oxygen and water vapour. Optional values: the potential future value of the rainforets in terms of medicinal properties of plants or natural resources in the ground such as bauxite, gold and fossil fuels. Sustainability: Use of global resources at a rate that allows natural regeneration and minimizes damage to the environment. For example, a system of harvesting renewable resources at a rate that will be replaced by natural growth might be considered to demonstrate sustainability. Sustainability is a major focus for many scientists, politicians and companies. The way humans have structured their economies over recent history has led to unsustainable practises such as the reliance on fossil fuels and importing food and materials from other countries if we exceed our own supply capacity. Sustainabile farming needs to produce the crops that we need without depleting soil quality, rivers or groundwater reserves or killing wildlife with added chemicals. Doing this without significant cost increases is the big challenge. Becoming more sustainable in food production but without pricing the poorest peoples out of the food market is essential. The use of natural capital in the production of products and services is virtually always undercalculated. In economics this is refered to as external cost. Firms calculate the cost of raw materials, services and energy that they hve had to pay for in the production of their good. They generally dont take into account the cost that other people have had to pay for though. Examples of this may be water or air pollution created in their manufacturing process, or the cost of healthcare for people affected by pollution. In this sense the price of many products does not reflect the true cost to the environment and society. The story of stuff video (excellent animation about the true cost of production and the importance of circular systems in production. Production of goods and services has traditionally been based on linear systems where the resourecs are extracted, processed, consumed and any waste sent to landfill. Finite systems require continual extraction of new resources and subsequent processing which results in ever increasing quantities of waste to be disposed of. With finite resources this is not a sustainable approach and we are already experiencing the consequences in the forms of scarcity and environmental damage. Manufacturers and society need to start establishing more circular systems for production and consumption. By encouraging the reuse or recycling of products the extraction of raw materials can be reduced, the pollutioon created through production and consumption can be lowered and the level of waste should fall. The most abundant but also most polluting of the fossil fuels. Large reserves of coal remain in many countries and are often located near close to the surface. It is the cheapest fossil fuel to extract in most cases. Coal fired power stations are being built on a large scale in some LEDCs such as China to power industrialisation. 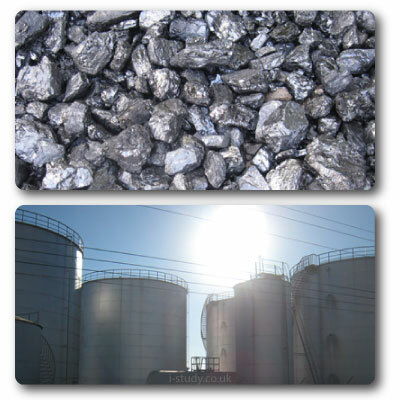 New technologies are being developed that allow cleaner burning of coal (Carbon Capture & Storage). Crude oil has become the fossil fuel that most economies rely on for their energy and transportation needs. Large reserves have been exploited and many people argue that we are currently nearing the peak and facing future shortages. New reserves such as the Alberta Tar sands have become economically viable due to the rising price of oil. Oil is less polluting than coal but more than natural gas. Many of the oils major reserves are in the Middle East. The cleanest of the fossil fuels in terms of air pollution. Large reserves of gas have been found in layers of shale underground in many countries. The avility to compress it to a liquid for transportation makes it easier and cost effective to move large distances on tankers & through pipelines. Many developed economies are increasingly relying on gas for domestic use (heating, cooking). Electricity generated by released water spinning turbines. This requires fast flowing water or high water pressure (dams). A very clean form of energy (after the intitial building of the dam). Many of the most suitable rivers have already been used to harness HEP. New projects are larger in scale and the turbines are more efficient. HEP dams destroy large areas of vegetation & can cause environmental problems downstrean due to changes in river flow. An increasingly popular form of power generation. Initial set up costs are high. There has been opposition to wind farms in many places due to the impact on the scenery, noise pollution and danger to birds. Large offshore wind farms are being developed but these required considerable investment and need infrastructure to deliver the power to where it is used. Larger windmills are increasing efficiency. Wood is non-renewable in the sense that once it is burn it is used. It is regarded as a sustainable resources since if forests are managed it will regenerate and provide a continuous supply. Wood is used primarily in LEDCs for fuel for heating and cooking. 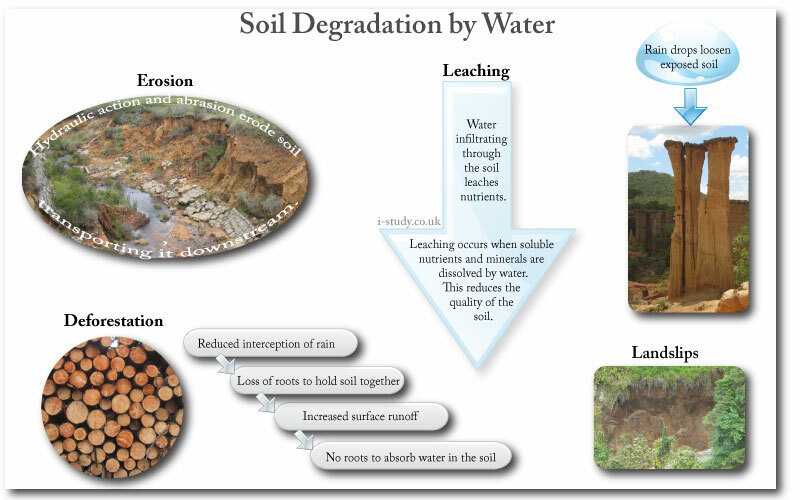 Deforestation in mny LEDCs due to demand for wood as a fuel is leading to major environmental problems such as soil erosion, desertification and increased flooding. Efficient wood burners & maanagement strategies are helping. Using the heat of the earth to generate power. It is commonly used as a source of heating for buildings through pipes that heat water underground & then run through houses. In some places it is used to generate electricity by using the steam to turn turbines Indonesia & the U.S.A. There are few negative side effects of geothermal power. It is very expensive to set up but then requires no additional fuel once established. Why do Different Societies use Different Energy Resources? Environmental: environmental conditions and features may provide the opportunity for certain types of power generation. Countries that have fast flowing rivers in deep valleys are often able to dam the river to generate HEP. Examples include China, Brazil, Scotland. Other countries have reliable clear skies and sunshine and therefore suit solar generation such as Saudi Arabia and Qatar. Iceland uses geothermal power due to its tectonic conditions. 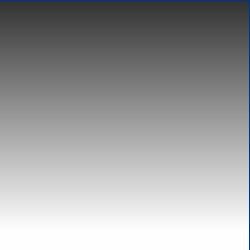 Economic: the economic situation of a country often determines the type of energy resources used. Poor countries cannot afford to invest in large schemes such as nuclear power station or HEP dams. Additionally they often lack the infrastructure to deliver electricity to many parts of the country. 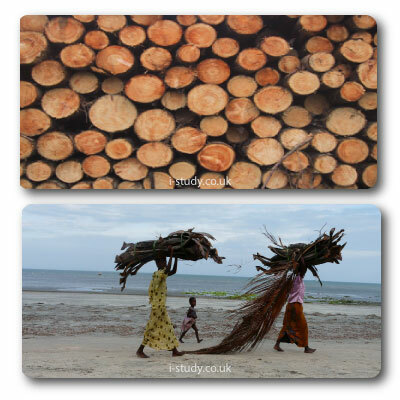 In these countries wood is often used in rural areas the fuel for cooking and heating. Countries that are wealthy often use have high per capita consumption of energy and rely on fossil large scale fossil fuel or nuclear plants. Availabilty: some countries simply do not have certain resources, they have to choose to import them or use different resources. Japan lacks significant fossil fuel reserves and has historically imported them on a large scale. It also invested heavily in nuclear power generation to reduce its reliance on fuel imports. 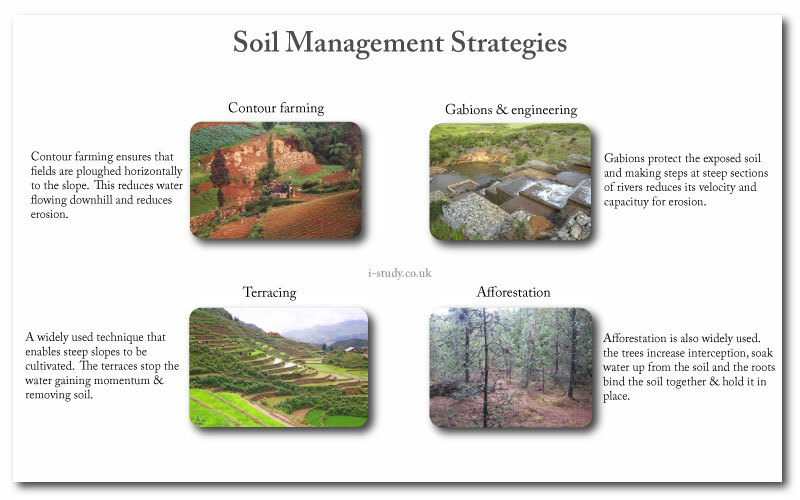 Clay: very fine soil, can absorb large amounts of water, heavy & low porosity. Clays are good nutrient holding soils. Sand: coarse material, highly porous,high drainage capacity and low nutrient content. Generally a mix of the different types gives the best soil for plant growth as these can benefit from good drainage and nutrient content aswell as being easier to work. 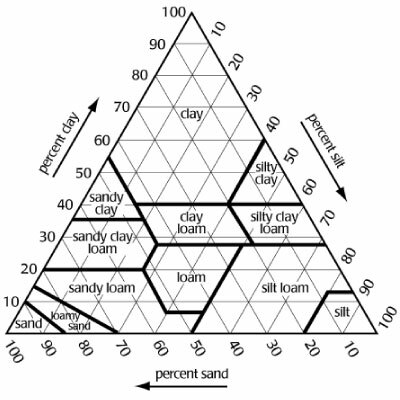 Soil pyramids show the proprtions of sand, silt and clay that make up the different soil types. You should be able to read the data displayed on these. Identify the 0% line for each axis which should indicate the direction of the line to follow. A loam is a mix of the different types of soil particle. Overgrazing occurs when increases in the number of animals result in the vegetation being eaten and damaged unsustainably. The animals hooves trample vegetation and compact the soil. New shoots are eaten before the plant can establish itself. Overgrazing results in decreased vegetation cover which exposes the soil and leaves it more vulnerable to erosion by the wind and water. Crop rotation is a technique that is used to allow soils to replenish their nutrients and avoid becoming degraded. farmers plant different crops in the fields on a rotating cycle. 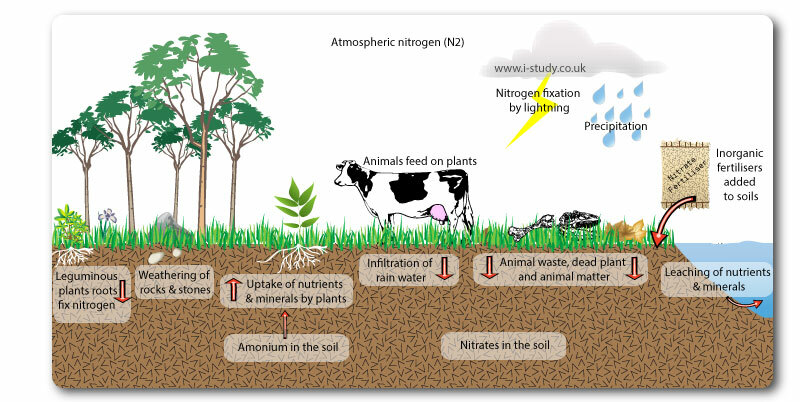 It works because different plants take different nutrients from the soil and some (legumes) even fix nitrogen into the soil through their roots. Fields may be left fallow (empty) as aprt of the crop rotation cycle to allow a rest period. Throughout history there have been advances in agricultural practises and equipement. The move from nomadic lifestyles to sedentary farming techniques led to significant changes in peoples diets. Since then we have developed machinery to increase productivity of labour, developed chemicals to aid growth and reduce disease and parasites. In recent decades the explosion of global populations has demanded new approaches to increase the food supply. The Green Revolution: this started in the 1940s but its impacts were mainly felt from the 1960s onwards. Selective breeding of wheat and rice led to more resistant and higher yielding crops. Coupled with irrigation and fertilisers it vastly increased the food production in Mexico, the USA and India. It was most successful when farmers could afford to invest in the additional capital inputs required. The increased supply of cereals led to a fall in price which ws good for consumers. It meant that small scale farmers that had taken loans to invest in the needed inputs struggled to repay their debts though. There are concerns about the lomg term sustainability of the green revolution as large scale irrigation is depletinhg rivers and underground aquifers. Indian potatoe farmers have experienced falling water table levels and are digging deeper wells to extract water that is becoming increasingly saline. Agriculture exists in all economies in some form or other. Rising populations are decreasing the land available for agricultural practises whilst at the same time increasing the demand for food. This results in ever increasing demands for increased productivity from the land and farmers. Subsistence farming: the practise of growing food for consumption, not for selling. Typical in developing countries where farmers have very little capital inputs such as machinery, fertiliser, pesticides and irrigation systems. Yields are likely to be low and the methods are usually labour intensive. The lack of additional produce to sell means that there is little chance to invest in capital to increase the yields. Commercial farming: the practise of growing food specificaly for sale. Commercial farming is profit motivated and usually involves a high level of inputs such as irrigation, fertilisers, pesticides, greenhouse and climate control systems etc. The investment in capital leads to higher yields and the processes are often highly mechanised rather than labour intensive. Commercial agricultural practises have expanded into biofuel production in recent years. Monocultures are typical in commercial farming (sugar cane, palm oil, cattle ranching, bananas). Pastoral farming: rearing and caring for livestock (cows, goats, sheep, pigs). Arable farming: growing of crops - for food consumption or use in other products (potatoes, bananas, sugarcane). Extensive farming: farming that requires a large amount of land with low inputs and outputs (hillside cattle farming, nomad catlle and goat farmers in East Africa). Intensive farming: farming using a small area of land and maximising its output through high levels of inputs. (commercial greenhouse vegetable production). Bananas are produced on a huge scale in Panama. The produce is destined mainly for European and North American markets rather than domestic consumption. 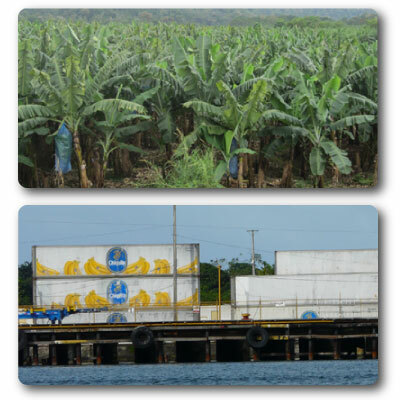 Several large companies dominate the industy in Panama & Costa Rica: Chiquita, Fiffes, DelMonte and Dole. Irrigation systems, fertilisers, pesticides and herbicides are all used to increase the yield. Banana bunches are covered in blue plastic bags to keep insects off. Banana bunches are harvested by hand & then hooked onto pulley systems to be transported through the fields back to the main warehouse. They are rapidly loaded into containers on lorries to be taken to the nearby port where they are put onto cargo ships. Traditional patoral techniques are still practised by the indigenous Maasia tribes in Tanzania and Kenya. Although increasing populations have led to significant reductions in the land available for nomadic cattle and goat herding, it does stilloccur in a more restricted sense. Mosts tribes have semi-permanent encampments (bomas) and the distances that cattle & goat herders travel are less, but a large part of the wealth of tribes is still the number of livestock that they own. The animals & herders wander the savannah looking for good grazing which follows the seasonal rain belts. The Maasai are allowed to continue their traditional agricultural practises in some of the countries national parks such as the NgorroGorro reserve - where all other agricultural practises are banned. The water budget is the breakdown of the water existing on the planet and in the atmosphere. The vast majority of the water on the planet is is the seas and oceans and is salt water. Only a small fraction (2.6% by volume) of the Earth’s water supply is fresh water. Of this, over 80% is in the form of ice caps and glaciers, 0.6% is groundwater and the rest is made up of lakes, soil water, atmospheric water vapour, rivers and biota in decreasing order of storage size. 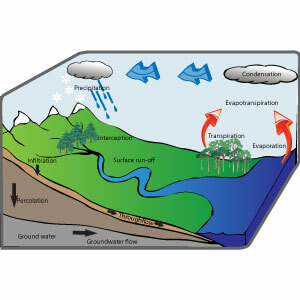 The hydrological cycle represents the flow of water in its various states through the environment. The places where it is held in one place are known as stores (clouds). The parts of the cycle that represent it moving to another stage are known as transfers (precipitation). The total sum of the flows and stores is equal to the water budget. Agriculture: commercial agriculture uses vast quantities of water for irrigation, this is taken from both rivers and aquifers and is significanty depleting many of them. Increasing levels of wealth in developing countries are enabling a change in diets with people increasingly able to afford meat (especially beef). Producing beef is much more water intensive than cereals in relation to the energy gained from consuming it. Industry: many industries are use large volumes of water in their processes. Textile manufacturing, cleaning tars sands in Alberta for oil extraction, thermal power generation are examples. As the demand for manufactured goods increases the demands for fresh water in industy also increase. The tourism industry uses vast amounts of water for pools, guests showing multiple times a day (beach holidays), landscaped gardens and leisure facilities such as golf courses. Domestic consumption: increasing populations naturally increase the domestic consumption of water, however domestic consumption is much less than the previous two factors. Domestic consumption: increased efficiency of washing machines, dishwashers, showers, and toilets are all reducing domestic consumption. Water meters are being installed as standard in the UK to enable consumer to save money through saving water (rather than paying for average population consumption). Agriculture: changing irrigation from spray or boom systems to drip/trickle systems where the water is directly released onto the soil in close proximity to the plant is far more efficient. Drought resistent varieties of crops allow reduced irrigation. New approaches to crop planting with varying height crops planted together to provide shade and reduce evaporation from the soil. Spains hot dry climate in the South has attracted huge investment in tourism. Golf courses, hotels complexes with multiple simming pools, water parks and manicured gardens line the Costa del Sol. The upkeep of these requires vast quantities of fresh water and demand is exceding supply. Polytunnels of fruit and vegetables also place high demand on freshwater. Spanish authorities are needing to act quickly to avert major droughts occuring. Desalination plants have been established in many municipalities (Marbella, Puerto Banus, Benalmadena) to help supply water during the dry summer months when tourism is at its peak. Resoviors such as the one at Istan (North of Marbella) have been built to store Winter runoff and meltwater from the Sierra Blanca mountain range. One of the major issues facing Spain authorities is the use of illegal bore holes on private property. There are an estimated 50 000 illegal bore holes from which farmers, golf courses and residents pump water for irrigation. These are depleting the natural aquifers and the authorities have little impact in regulating them. In 2005 a scheme to divert a river in the north of the country (Rio Ebro) to the southern coast was cancelled due to concerns over the environmental impact that it would have and the huge economic cost of implementing it. The concept of carrying capacity can in theory be applied to any species populations if their requirements and the resourecs available in the environment are known. Thomas Malthus introduced the concept of optimum and over-population based on the ability of humans to produce at an exponential rate which would eventually outstrip increases in food supplies. The Club of Rome then furthered his ideas in the 1970 identifying other factors that would ultimately limit population size: natural resources, food production, pollution and industrial production). Food production. Humans have managed to consistently increase food supplies. Initially through mechanisation, then through the green revolution which used irrigation, pesticides and herbicides alongside HYV seeds to dramatically increase crop yields. Food production has so far been able to meet increasing demand and new technologies such as vertical farming, and genetic modification of crops look like further increasing our output potential. Natural Resources. Humans have established techniques for recycling many resources which enables us to slow their depletion considerably. As resources become increasingly scarce their value and subsequent price rises which spurs humans to increasinlgy recycle. Humans have also been very successfull at finding substitues for resources that are becoming scarce. Synthetic materials have replaced many natural products and again, as prices rise subsitutes are found and adopted. This makes establishing a carrying capacity level difficult. Disease. Many species populations become vulnerable to diseases which devastate them when their environments become densely populated. Humans have consistently found cures to diseases and used vaccinations to successfully control and sometimes erradicate diseases. In recent years swine flue and bird flu have caused concern about whether epidemics would break out and spread through urban areas. Identifying a level at which disease is likely to limit growth is very difficult. Globalisation. International trade and travel has enabled communities to import needed resources from other parts of the world or to migrate to areas that are less populated or have more resources. This makes establishing carrying capacities for smaller communities much more difficult. The following calculations are simplified to take into account just a few and easily measurable values, in reality total resource consumption should be calculated aswell as total waste. Data for food consumption are often given in grain equivalents, so that a population with a meat-rich diet would tend to consume a higher grain equivalent than a population that feeds directly on grain.